Blue Wahoos pitching coach Cibney Bello hugged Brusdar Graterol in the Pensacola clubhouse following tonight's 4-3 win over Jacksonville and loudly exclaimed "I'm so proud of you!" He wasn't talking about Graterol's performance on the field. Not that it wasn't worth being proud of; Graterol, just 20-years-old, threw 5.2 scoreless innings to earn his first victory at the Double-A level. But instead of celebrating the win, they were celebrating what might in fact be a bigger step in the young pitching prospect's life. Graterol, the fast-rising righthander from Venezuela with a fastball that makes radar guns blush, had just finished his first ever post-game interview in English. "I have only studied English for a year, a year and a half," Graterol, a native Spanish speaker, said after finishing the interview. "Last year, I couldn't speak at all. I was very nervous in English. But, my teammates help me practice every day and I'm more comfortable now. I'm happy to be learning and speaking better." Following his big night on the mound, Graterol controlled his interview with local media in English much like he controlled his high octane fastball on the mound. The Twins top pitching prospect pitched into the sixth inning, hitting 100 miles-per-hour on the radar gun while forcing weak contact with a complimentary array of off-speed pitches, allowing just three hits in the ballgame. "I feel really good right now, so happy," said Graterol. "I like everything here. I like the field, I like the fans, so I am very happy here." 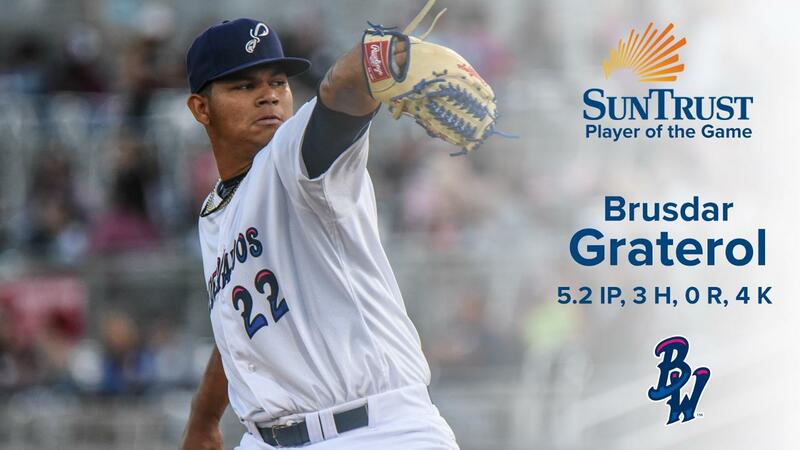 Graterol's excellent performance tonight followed his 4.2 inning effort last week in Mobile, where he also allowed just three hits while recording six strikeouts. "He's been outstanding," said Blue Wahoos manager Ramon Borrego, whose hometown in Venezuela is near where Graterol grew up. "You see this kid pitch and you just know it's special." When Graterol left the mound in the sixth inning, having just retired the last two batters he faced on strikeouts, including blowing a 99 mile-per-hour fastball past a Jumbo Shrimp hitter for strike three in his final at-bat, the Pensacola crowd gave him a loud, standing ovation. Showing his personality, Graterol tipped his cap several times to acknowledge the support. "I really like the fans here," he said. "I love it." The performance continued what's been a rapid climb after Graterol missed most of the 2016 season and all of 2017 recovering from Tommy John surgery. Last year in his return to the mound, he excelled and climbed quickly from A-Cedar Rapids to Advanced-A Fort Myers, helping the Fort Myers Miracle win the Florida State League Championship. "He keeps going like this...it could be something really good," Borrego said. In the game, the Blue Wahoos gave Graterol early run support. Jordan Gore led off the home half of the first inning with a single, then scored on a single by Mitchell Kranson to make it 1-0 in Pensacola's favor. The score remained locked at 1-0 until the sixth inning when Jimmy Kerrigan knocked a two-out two-run double to put the Wahoos up 3-0. The insurance run proved pivotal, as Blue Wahoos closer Dusten Knight gave up an eighth-inning run, but retired the Jumbo Shrimp with a pair of strikeouts in the ninth to earn his second save. After recording the final out on a strikeout, Knight capped off a successful night at Blue Wahoos Stadium for the Pensacola team and fans with one of his signature backflips on the mound. Sponsored by Hill-Kelly Dodge, the KlassKids Search Center from California attended the game to help founder Marc Klass celebrate his 60th birthday. Klass' 12-year-old daughter, Polly Hannah Klass was murdered in 1994, prompting Marc Klass to start the KlassKids Foundation and bring awareness to kids who have been subjected to violence. In addition, the STEAM Innovate team from Santa Rosa County was part of a mass group attired in green. They are the first STEAM team in any U.S. school district. STEAM stands for science, technology, engineering, arts and mathematics. The program is in its third year.